You're cordially invited to our BBQ Afterwork at one of the most amazing venues in Brussels... 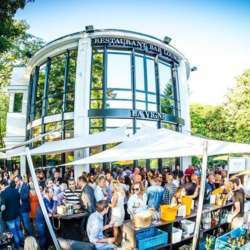 Le Vignoble and its magnificent terrace, boasting a spectacular view over the Woluwe-Saint-Pierre Parc. If we're blessed with good weather, the terrace will be open for us to enjoy. No need to go home, BBQ (ie. chicken wings, burgers) will be available to buy on the spot. Spread the word, bring your friends and come along to mix and mingle with a bunch of wonderful international crowd and unwind to the DJ's beats at this fantastic terrace. If you're a newbie and it's your first time to join, don't worry, just give a shout to the person at the desk when you arrive, and I'll come to greet you and help you get acquainted with other members. You can reach Le Vignoble by public transport; Tram 8 & 44 station: Musee du Tram. 10 minutes from Schuman by car – free parking is available onsite.